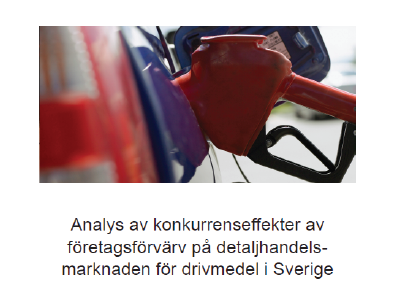 Dr. Mattias Ganslandt and MSc Gunilla Rönnholm at the Center for European Law and Economics have within the frame of the Swedish Competition Authority’s commissioned research, analyzed the effects of mergers and acquisitions in the retail market for gasoline in Sweden. This study describes and analyzes the extent to which mergers and acquisitions in the retail market for gasoline in Sweden have had a noticeable effect on prices and margins for gasoline and diesel. The main objective of the study is to examine how consumer prices have been affected by the increased market concentration, especially after Statoil’s merger with Hydro in 2007 and StatoilHydro’s subsequent acquisition of the JET stations in 2008-2009. The main conclusion is that the empirical analysis does not support the hypothesis that increased market concentration in the gasoline market during the period 2001-2012 has led to gasoline companies charging a noticeably higher gross margins. An empirical analysis of the average gross margin for gasoline 95 octane and diesel during the period 1985 to 2012 (annual basis) and 2001-2012 (monthly basis) shows no systematic relationship between a higher gross margin in absolute or relative terms and increased market concentration. Both the level of market concentration and the consumer prices of gasoline and diesel has increased during the period, but the price increase is explained by other factors than that the gasoline companies exercising greater market power as a consequence of mergers and acquisitions. The empirically most important explanation for the increase in consumer price is a higher commodity price, an effect enhanced by a proportional increase in the VAT with the increase in the commodity price. An empirical analysis of the recommended gross prices for the major gasoline companies during the period 2003-2012 shows, first, that companies adjust their prices with little or no lag in relation to each other’s price changes and that the companies basically set the same recommended gross price. Further analysis shows that on average, the price difference between manned service stations and automatic stations decreased when comparing the years 2003-2007 to 2007-2012. For gasoline, the difference decreased from 20.3 öre/ liter to 17.5 öre/ liter. For diesel, the corresponding change is 21.4 öre/ liter to 20 öre/ liter. This change is empirically interesting because Statoil’s acquisition of Hydro and JET meant that the differentiation between the large national chains decreased. Primarily JET but also Hydro’s brand Uno -X was a pronounced automatic station chain, whose strategy was to keep systematically lower prices than service stations. JET had as an independent company the strategy of always offering a price which was 25 öre/ liter lower than the corresponding price of service stations. It is reasonable to assume that the price difference between different station concepts was not optimal for Statoil, whose interest was and remains to promote cross-sales of other products and services at service stations. The reduction in the price difference between automatic stations and service stations is a possible effect of the fact that JET is no longer a stand-alone gasoline chain with only automatic stations. Meanwhile has no change occurred due to the decreased price difference between the Statoil service stations and the unmanned Jet stations without the price of the other companies’ unmanned stations has grown slightly closer to the price of the service stations. Besides an increased market concentration, there have been other changes that have affected the costs of the gasoline companies. These changes have impacted consumer prices. An empirical analysis also shows that these changes have been more important for retail prices than the effects that increased market concentration may have led to. Consumer prices for gasoline consists of the following components; tax, product cost, gross margin and VAT. Of these elements tax constitute 37 % of the sales price, product cost 34%, gross margin 9% and VAT 20% of the sales price for gasoline 95 octane in December 2012. For diesel, it is the following shares of the selling price ; tax (34.5%), product cost (38.1%), gross margin (7.4%) and VAT (20%). There has been a change in consumer behavior as a result of the introduction of new regulatory instruments and the ongoing technology development. The majority of new car sales in Sweden have shifted from gasoline to diesel cars. Increasing fuel efficiency has driven a rationalization and reduction of the number of fuel stations in Sweden. The trend has moved from 4391 gasoline stations in 1984, to 3930 in 2003 and 2885 in 2011. 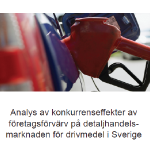 Since 2003, 1,045 fuel stations closed down in Sweden, equivalent to 26.6% of the entire market. Since 2006 the majority of all gasoline stations are unmanned stations (1720 in 2011), SPBI (2013c). The rationalization of station networks has increased the costs for gasoline companies, both in terms of clean-up costs for stations that had to be been undertaken, and a change in the offerings of stations on both the technical support as well as fuels sold, including the impact of the pump law, that it is mandatory for the stations to provide a renewable fuel at each station that is sufficiently large. In 2010, 1813 of 2937 or approximately 63% of all gasoline stations provided a renewable fuel (e.g. biogas or ethanol), SPBI (2013d). Both the energy tax and the carbon tax are set by the state. During the period 2005-2012, the energy tax increased from 2.84 to 3.13 SEK / liter gasoline (MK1) and the carbon tax increased from 2.12 to 2.51 SEK/ liter petrol (MK1) in real terms, SPBI (2013e). The tax change represents an increase of 13.9 % during 2005-2012. Taking into account inflation and CPI adjusting the tax level, the increase is equivalent to a change of 1.7%. For diesel, the energy tax during the period 2005-2012 increased from 1.04 to 1.57 SEK/ liter diesel (MK1) and the carbon tax increased from 2.61 to 3.10 SEK / liter diesel (MK1). This represents growth of 27.9 % during 2005-2012. Analogously, CPI – adjusting tax level, the increase is equivalent to a change of 14.2%. Product cost is made up in large part by the cost of crude oil, transport and handling costs and the cost of storage. During the period 2003-2012, the price of crude oil, for example, Brent spot price or WTI spot price was very volatile. The average price in the period was 73.3 USD / barrel, while the highest price was $143.95/ barrel and the lowest price was 23.23 USD/ barrel, EIA (2013). This entry was posted in Anti-trust, Regulation. Bookmark the permalink.